Oratory speech topics for factual persuasive and controversial public speaking at an Original Oratory – O.O. – high school forensic competition or Toastmaster International event and a handy oratory template. I think these ideas are also suitable for the regional and local American National Forensic League (NFL) and National Catholic Forensic League (NCFL) competitions. a. In short, original oratory speech topics are mostly factual, policy based and conviction reinforcing. b. The public speaker motivates and inspires the audience to take a standВ on current problems in the world. d. Often there is a maximum limit of 150 quoted words. Do not forget to mention the source of the quotation properly! e. It must be between 7 and 10 minutes in length. That is, in general, the span of the concentration of the listeners. Remember, every organization has its own rules and requirements. Study them and in doubt, ask the judges or governing body to make a judgement on your format ideas on beforehand. A Cellular Phone Causes Highly Electromagnetic Radiation Risks. Violent Video Games Do Promote Violence. Mercy Killing Should Be Made Illegal. There Is No Need For Any Special Children’s Rights. Obesity Is Only Between The Ears. A Multi Party System Will Not Benefit Our Democracy. Dumping Your Granny in a Nursing Home Benefits Her. The Police Is Using Deadly Force More Often. Safety Precautions Must Also Regard Speech Privacy Issues. I have developed a simple but effective format template for your convenience to sort out oratory speech topics easily. Try to add at least two factual and powerful supporting points per major point. В В A. Attention hook to make them want to listen. В В B. What your public speaking speech is about – your thesis statement in brief. В В A. What is the problem or impending danger? В В A. What is causing the problem. В В A. The negative effects. В В A. Offer an innovative solution or recommendation to fix the problem. В В A. Restate the oratory speech topics in a nice memorable twist. В В B. Make a tie with your introduction paragraph, loop back to the central questions. В В C. Encourage them to change their intractable beliefs, stubborn values or obstinate and ineffective policies. В В D. Close with a memorable idea statement. 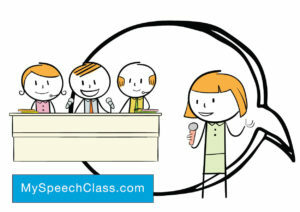 Read all instructions and try to find examples of previous winning oratory speech topics that are adjustable too. And my last golden tips for O.O. speakers: always check out the precise requirements of your Toastmaster International public speaking instructor or the organization who hosts the competition or tournament event. Cite this article as: Jim Peterson, "10 Oratory Speech Topics + Template," in My Speech Class, May 11, 2018, http://www.myspeechclass.com/oratory-speech-topics.html.